In February of 1968, JF Bermejo and Simón Camacho established Nicaragua Cigar Co., becoming the country’s first cigar manufacturer. 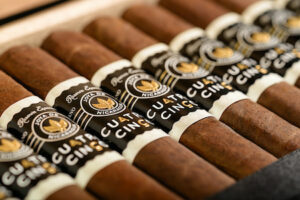 From the City of Esteli they produced the Joya de Nicaragua and marketed the line worldwide. In 1972 the Nicaraguan Dictator Anastasio Somoza DeBayle traveled to the White House discovering that Joya Cigars were a preferred brand of President Nixon and staff. Under political pressure, Bermejo sold part of Nicaragua Cigar Co. to dictator Somoza, who used his position to promote Nicaragua cigars. The company also increased production to include other brands such as The Fifty Club, Rosalones, and Count Christopher. Success is always sweeter after turmoil. With a country on the verge of a revolution and civil war, adversity was coming. After a series of successes, Nicaragua Cigar Co. moved to a newer, more modern factory only to have it destroyed by the Sandinista Popular Uprising less than 2 years later. After rebuilding by the hands of unpaid employees, Nicaragua Cigar Co. was back on track selling in the United States and in Europe, until the US imposed a commercial embargo on Nicaragua. In 1984, Civil War breaks out leaving only women and the younger generation working in the factories. However, after years of turmoil and roadblocks, the fortune of Nicaragua Cigar Co. began looking up as the war came to an end in the 90s. After a decade long embargo, Joya de Nicaragua returned to the United States and eventually under new ownership. With state companies privatized in Nicaragua, Doctor Alejandro Martinez Cuenca, and owner of Tabacos Puros de Nicaragua S.A., acquired Nicaragua Cigar Co. Following the 1990s cigar boom, Cuenca began developing new lines, releasing Antano 1970 and the highly acclaimed Celebración. With new success and a growing presence in the United States, the company was in need of a new distributor, eventually hiring the innovative Drew Estate to compliment their authenticity. In acknowledgement of the brand’s great value, Tabacos Puros de Nicaragua was renamed Joya de Nicaragua in 2009. Doctor Cuenca collaborated with José Blanco from Dominican Republic producing the C y B to become the number 1 cigar in Halfwheel’s Consensus Top 25 of 2012. Today, Joya de Nicaragua continues to be known for Nicacaragua puros, continuing on the legacy of Nicaragua’s first premium, hand-rolled cigar.